The second change would create a new tool for communities to install stricter design rules in certain areas. The so-called neighborhood protection overlay districts would act as a new zoning category placed on residential areas. A community would have to petition to create the district, which would lay out design requirements for new buildings and renovations tailored to the neighborhood. For example, community members could choose to create rules making sure any commercial development is the same height with the same architectural style as the surrounding residential neighborhood. Councilman Bob Weiner said the creation of the districts would allow government to work with residents to more clearly define the type of construction they want in a way not available under current rules. "We don't, as a community, have enough tools in the toolbox," Weiner said. In the coming month, New Castle County government will vote on significant changes to local development rules that could affect everything from residents' backyard views to the length of their morning commute. County officials say the changes to the Unified Development Code are necessary to give the character of neighborhoods more protection from an eyesore some developer might want to build down the street. But some fear the changes will give builders an upper hand in persistent battles over projects' impact on local traffic. County Council's Land Use Committee is scheduled to discuss the changes Tuesday and then vote on them the following week, on Jan. 10. The Unified Development Code is a 515-page document that provides standards for projects being approved by the county Land Use Department. The code is wide-ranging and detailed, touching on issues from allowable building height and subdivision designs to how developments impact traffic, sewer service and the environment. Any new building or renovation needing a permit has to abide by the code, making the document a kind of master blueprint for all future projects. The overhaul has been the subject of two years of work, which included dozens of public think tank meetings and hundreds of thousands of dollars in consultant fees. In trying to strike a balance between concerns about congestion and a need to fast-track so-called "job creator" projects, the effort has been delayed multiple times. The changes being voted on were planned as the first wave of overhauls. Future revisions are expected, though it is unsure how that might change under the administration of County Executive-elect Matt Meyer, who takes office Tuesday. On Friday, Meyer did not take a position on the proposed changes. For now, council will consider three new aspects. The first would provide a set of guiding principles for future projects, pushing builders to designs that fit the scale and architecture of surrounding neighborhoods. The guiding principles would amount to suggestions for developers when considering the look and feel of a proposed project. It's a way to have greater standardization of how projects look in residential and commercial corridors but not required, land use officials say. "This is an attempt by the land use department to have better quality plans come forward," said Tom Dewson, a community activist who has been working with the county on the proposed changes for more than a year. For example, current rules might allow construction of an aluminum building among colonial brick homes. The guiding principles would suggest developers build with a similar style as the neighborhood. Dewson said there is currently too much flexibility in terms of what commercial development is allowed adjacent to residential areas. This is a chance to give residents more say in that. "There are significant gaps in the code today," Dewson said. "It does not protect residential neighborhoods that adjoin commercial development." The third change being considered is the so-called economic empowerment district. An economic empowerment district act as a new zoning category landowners can have applied to a parcel they wish to one day sell or lease to a large employer in one of several fields like aerospace and agricultural science. County Council would approve applications. 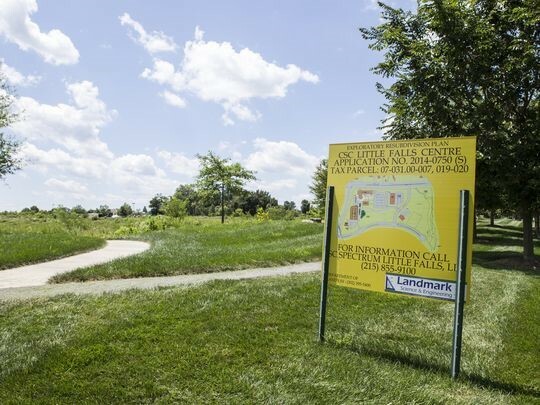 That approval process can take place before the landowner has a tenant identified and will include the traffic, environmental and other studies, land use officials said. The idea is to complete the time-consuming work of setting out exactly what can be built on a particular parcel before a potential tenant is ready to sign. Officials said it could lead to a company starting construction on a new headquarters within six months as opposed to the more-than-year-long process for current major plans. The economic empowerment district is seen as a way to address a longstanding business-community complaint that New Castle County hampers its ability to attract large employers because its development-approval process takes too long and is unpredictable. The Caesar Rodney Institute, a Delaware-based conservative think tank, said in 2012 New Castle County building rules also led to stifled economic development, resulting in a loss of 5,500 individuals and $560 million of adjusted gross personal income from out-migration from 2005 to 2010. Councilwoman Janet Kilpatrick said the new districts will allow more leeway for government and residents to responsibly shape the future of a particular parcel in a way that is less restrictive than prohibitions placed on the deed for properties. "I see this as a step in the right direction," Kilpatrick said. The two new districts being debated by County Council have caused some controversy. Chief among the opponents is Vic Singer, former chair of the New Castle County Planning Board. He said the districts could open up the county to a repeat of the Barley Mill Plaza conflict, a controversial commercial and residential development near Greenville announced in 2008 that triggered a wave of disapproval from residents. County Council approved the initial rezoning to allow the project without consideration of traffic impact only to have the decision overturned by the courts after years and millions spent on the legal battle. Singer's concern is that when County Council approves the creation of an economic empowerment district or neighborhood protection overlay district, it could do so in a way that eases restrictions that limit development near crowded intersections. Current rules require a developer to improve the local highway infrastructure if they are building near an intersection that is deemed as too congested. Singer said such a scenario would lead to a legal battle similar to that seen for Barley Mill Plaza, a concern when a developer wants to build a highway-clogging project in an area where residents don't have the same legal "war chest" as Greenville residents did for the Barley Mill fight. "Council is asking: 'How much justice can you afford?'" Singer said. Plans show proposed development of open field near the intersection of Centerville Road earlier this year. New Castle County Council is weighing tweaks to the rules that dictate new building. It's a question subject to legal interpretation, but Mark White, a consultant hired by the county to help craft the proposed changes, said language was added to the new rules to make sure protections for traffic and other quality-of-life concerns cannot be circumvented. "We made sure crystal clear that those requirements stay in place," White said. Shawn Tucker, a former official in the county's Land Use Department who is now a private land use attorney, disagrees with Singer's interpretation and says council will not have leeway to ease traffic restrictions under the new law. "There is a clear effort and a line drawn in the current efforts that cuts off any discretion council has later," Tucker told County Council at a hearing about the proposed changes recently.